Analog Artist Digital World: ODD3 had about 15 artists drinking, drawing and collaborating. ODD3 had about 15 artists drinking, drawing and collaborating. 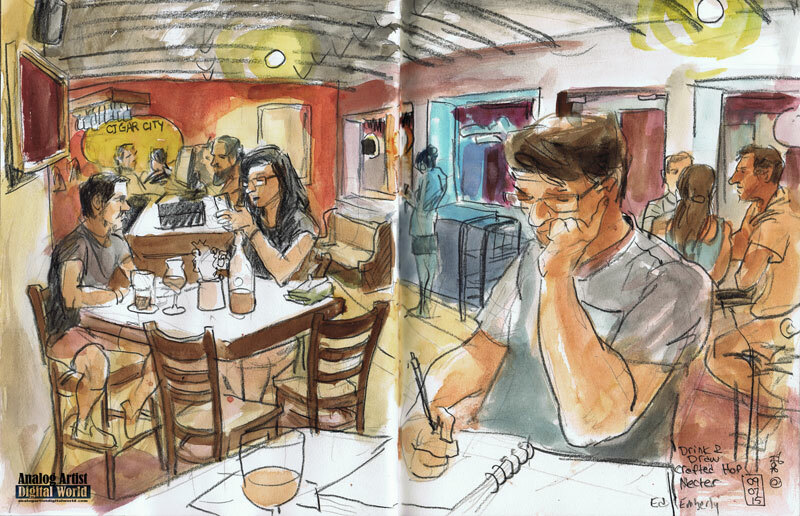 The third Orlando Drink and Draw (ODD3) fell on Labor Day. Artists were to meet at Redlight Redlight (2810 Corrine Dr, Orlando, FL). I was afraid there might be holiday hours so I searched the web and found out the bar would be open from 5:30pm to 9:30pm. Since artists would start arriving around 6pm, I could relax. I went to see the movie Mission Impossible Rouge Nation, so I ended up arriving about an hour late. When I arrived,I bumped into Gay Geiger who was getting napkins from the food truck parked in front of Redlight Redlight. The building used to be a refrigeration sales store and the signage is still out front. The bar signage uses the same colors so it all blends in. Gay was in the back room of the bar with her daughter. I glanced through her daughter's sketch journal latter that night and there was a stunning collage of characters from the Japanese animated film "My Neighbor Totoro." I ran my fingers over the image to feel the amazing depth created. After that image I explored every page as if searching for Braille messages. This is what I love about this monthly event, I always get to discover and meet amazing artists. In the front room Carlos Basabe was at a long table in the corner along with about 6 other artists. There was one seat available but when I sat in it, I found myself blinded by a projector which was projecting an image on the wall behind me. The blinding light wouldn't do so I set up at a table near by. Colin Boyer and a friend sat at my table. I'm learning names slowly and sent around a sign in sheet that I forgot about, so it was left behind. Once I started my sketch I was lost in thought. I started my sketch by drawing Brian OHalloran at the end of the bar lightly in pencil. A young couple sat at the table in front of Brian blocking my view. They became my center of interest. Brian did a digital sketch of the beer he was drinking. Later in the evening he took a picture of the bar maid and he took a shot of me at work. Brian is now doing a series of sketches of people. I made a small accordion sketchbook and invited any interested artists to fill a page or two. When the sketch is unfurled you can see the stream of consciousness as each sketch builds off of the sketch preceding it. I'll bring the sketch to the next ODD event since it is a work in progress. Two young women were visiting Orlando from Walla Walla, Washington state and they heard about the event and joined us for the evening. They had bright markers and they added a splash of color to the nights sketch. Artists came an went in waves. All told I would say about 16 artists came out to mingle, drink and draw. I got to meet artists I'd never met before so to me the evening was a success.